Tyler Tadevic is, of course, referring to Yokohama's foray into American GT racing. The company has a strong presence in the JGTC, where they won the GT500 championship last year against Bridgestone, and a history of being able to go head to head with the best - remember PTG versus Schnitzer with the M3GTRs? But they've been absent since 2001 on a GT(S) car on this continent, and were only in the series last year with Miracle Motorsports (then joining PK Sport late in the year). Pacific Coast Motorsports is a young team. 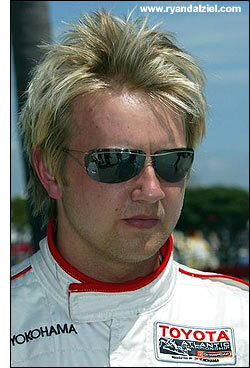 Tyler Tadevic founded the team for the 2003 season, after having managed World Speed Motorsport, while Alex Figge drove for them (Tyler was earning his stripes as a mechanic for WSM when Jeff Bucknum was driving for them). After a mediocre season, Tom Figge approached Tadevic about managing Alex's career; and Tyler Tadevic was quick to grasp the opportunity. Figge and Tadevic felt that the best way to ensure they could control the outcome was to control all aspects of the team. 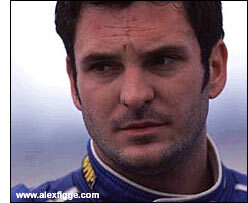 Tadevic decided to start PCM, and Figge ensured that any failure of the team would not be for lack of resources. Their first year as a one-car team was decent - Figge (right) finished as high as fifth, and ninth overall for season standings – so Tadevic decided they needed to expand to two cars, and bring in some proven talent to give Alex some incentive. Jon Fogarty, engineers Burke Harrison and Tim Lewis joined the team, and the performances came. Alex Figge won his first Toyota Atlantic race at Fundidora Park, and Jon Fogarty won the championship, over such highly touted talent as Ryan Dalziel, Danica Patrick and Andrew Ranger. Seventh overall for Figge was not satisfying, but it was not unexplained. "Alex probably would have been in the first few places overall had he had better luck, and if a few decisions had've panned out differently," Tadevic explained. Fogarty has now joined Flying Lizards in the GT2 Class of the ALMS this year - leaving the bulk of the 2004 team to move on to other things. At the end of the season, Tom Figge and Tyler Tadevic decided it was time to move up to a higher level, and they started looking around. "We were very happy in Toyota Atlantic, but it was purely a business decision. The series was great to us; it was simply time for us to move on." They seriously entertained joining the DP ranks within Grand Am, as well as Champcar, but after attending the closing round of the ALMS at Laguna Seca, they were sold on the series. "The cars were very open technically, they would give our engineers a challenge. 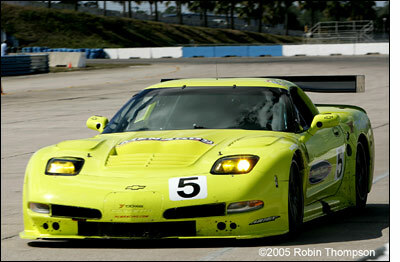 The on-track driving was technical and precise, which appealed to our open-wheeled background, and the racing was good. And the fans - they were so knowledgeable, and enthusiastic, and plentiful! The track was very well attended." They met the ALMS officials at the track, and Tadevic was impressed with the level of support offered by Scott Atherton and company, in helping him put together his program. Enter the Yager family. 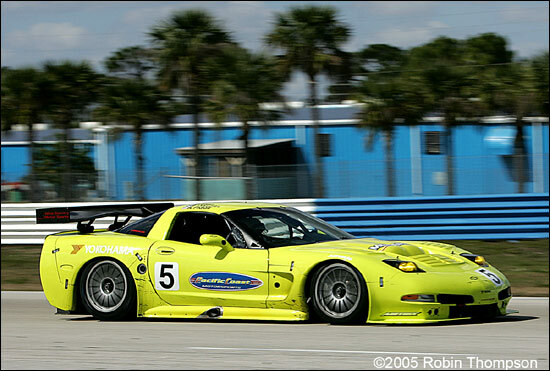 Mike Yager owns Mid-America Motorworks, the premiere Corvette aftermarket store in the world. His sons Michael and Brock are aspiring Barber Dodge racers, and were looking for a way to leverage their Corvette background into a C5-R. 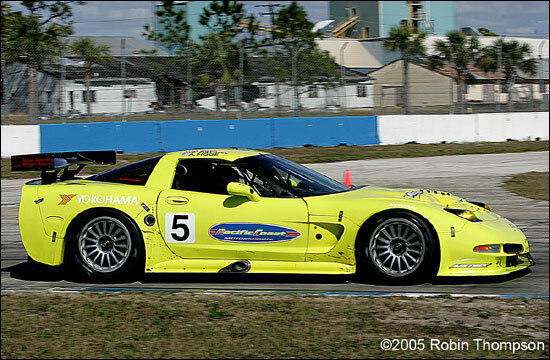 Since Barber Dodge and Toyota Atlantic series both supported Champcar, they had met Tyler Tadevic in the paddock - and together the Yagers and Tom Figge and Tyler Tadevic decided it would be a two-car Corvette team, run under the Pacific Coast Motorsports banner. Unfortunately, circumstances intervened that set the Yagers back a year in their plans, but the team's original contacts with GM and Pratt & Miller had already been forged, and PCM decided to continue as a single car team. "Not only was the program interesting, but the price was not prohibitive. We got our initial setup for considerably less than the Daytona Prototype program we had looked at. That lets us put our budget toward team development." 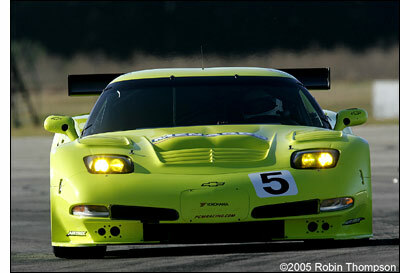 The three-year plan includes looking at a Le Mans entry in 2006, hopefully running the C6.R. Their Toyota Atlantic connections were further utilized in signing Alex Figge's Atlantic rival, Ryan Dalziel (left). 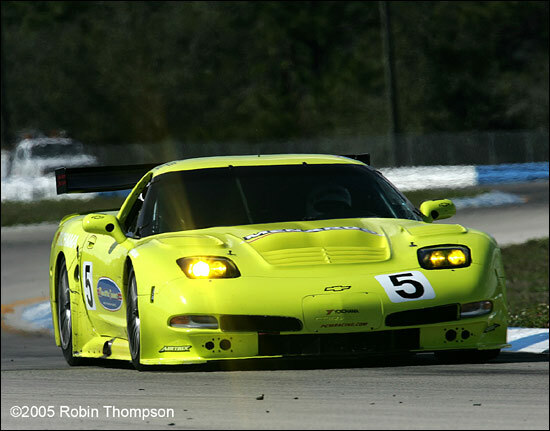 David Empringham will join the two for the Sebring 12 Hours. So Alex Figge has gone from having the 2004 series champion as team-mate to having the 2004 runner-up as teammate. "The drivers are all well-matched; they were within 0.5s of each other this week," Tadevic said. Alex Figge is still learning how to drive with fenders. "My Champcar test this weekend (with Mi-Jack/Conquest) felt great, the high power seemed to suit me more than the Atlantic car. I'm still getting used to the Corvette - it has the power, but moves around a lot more, it's heavier, has less aero downforce. But I'm really looking forward to the races." The team had approached both Michelin and Pirelli, as well as Yokohama, when exploring tire options; Yokohama's proposition "made the most business sense," Tyler Tadevic said. "They were interested in expanding their North American presence, and what better way to Americanize the brand than to run on Corvettes? And their trackside engineer, Cheech, is a wizard: he's working like crazy to get us up to speed. We're happy where we're at, considering how new this program is." Once the Yager portion of the team was put on hold, Tyler Tadevic wanted to look for some other support for the team. "It all came together quickly over the Christmas break, but we'll be running Menard's colours," he said. "It's a targeted marketing program, much like a Ganassi / Target or Andretti-Green / Seven-11 program." Menards has been sponsoring Busch, Craftsman Truck, and IRL racing, but this is their first full-time sponsorship foray into sportscars. "So we've got a competitive car, at a competitive price, with primary sponsorship from Menards, and the driving services of some of the best young talent available in North America,” summed up Tadevic. “We're already fast, thanks to the support of Pratt & Miller; it would be our dream scenario to think that, by mid-season, Pratt & Miller had to start keeping secrets from us!"